The day has finally come for all you coffee drinking geeks out there. 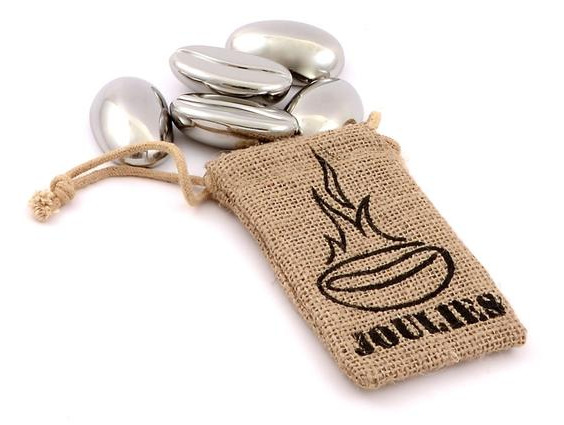 The Coffee Joulies are finally available to order and ship worldwide for the price of $100. So what are these polished stainless steel beans you ask? Instead of burning your mouth drinking your hot coffee, the Coffee Joulies absorb and harness the intense heat and let you drink your coffee sooner without burning your tongue. The Coffee Joulies will then slowly disperse the heat that they've absorbed throughout a much longer period so you can enjoy a warm cup of coffee for hours instead of it getting cold on you. These are a coffee geek's must have accessory! How do they do that? Their polished stainless steel shells are full of a very special phase change material (an ingredient in food) that melts at 140°F. When you put them in your coffee this PCM begins melting, absorbing a LOT of heat in the process and cooling your coffee down much faster than normal. Where does all that heat go? It’s stored right inside your Coffee Joulies™. When your coffee reaches 140°F (the perfect drinking temperature) the molten PCM begins solidifying again, releasing all that energy back into your coffee to keep it at a comfortable and delicious drinking temperature. The more heat you feed your Joulies, the longer they’ll keep your coffee warm.